The other night after work, I walked down to the pond. The sun was low in the sky, the shadows were long. I saw a mallard, a fish (an honest to goodness fish, 6-8 inches long) and a red winged blackbird. And then I saw this, and I was so excited I nearly fell into the pond. I managed to recover my balance and only ended up with a wet boot, which was fortunate because 1) I’m pretty sure me falling into the pond would have spooked this guy and caused him to move to another watershed, and 2) the camera would have gotten wet and then I wouldn’t have been able to take the dozen other pictures I shot. My new friend was a little suspicious of the statue (once I found my stability, I wasn’t moving!) that had turned up on the shore of his pond, and he swam big ‘S’ patterns across the water as he eyed me. Eventually he decided I wasn’t that interesting and he went back to paddling and diving. I was able to track him swimming under the water by following his bubbles. At one point he climbed out of the water onto the opposite shore and I got a better look at him. He’s a big guy! Almost 3 feet long, nice and round and very, very sleek. I’m not sure exactly what species he is. My best guess is some kind of muskrat, although I guess beaver or otter could be a possibility. I never saw his tail clearly, so that doesn’t give me a clue. Over the course of our farm search, the pond came on and off the must-have list. I really, really wanted a pond, but at times I was ready to sacrifice it in order to just get a farm. Now, I’m so glad we have the pond. It’s one of my favourite spots on the property. I love walking down to the water and just watching the sun glisten over the ripples, the reeds waft in the breeze and the bugs dance across the surface. Seeing this guy enjoying the pond was a complete bonus–a really special moment for me. For the weekend, I leave you with this video of our new pond paddler. All of you naturalists out there let me know in the comments what you think he is. Hi, Interesting post! 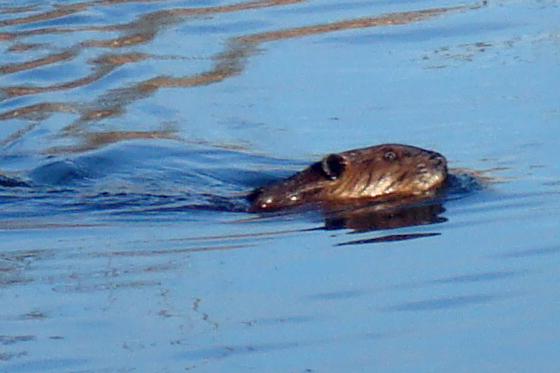 I was looking at your friend in the pond…in my opinion I think it is a beaver…I looked up otters, beavers and muskrats online and the closest to your photo is a beaver! I might be starting to lean that way myself. I think I saw a tail slap in the video, just before he dove. That’s something beavers do, right? We have two more votes for beaver. And the two votes come from the Dads, so that’s like four, really. I also vote beaver, he looks a lot like the one that was hanging around the office. I prefer this website a great deal, Its a really nice place to read and receive information. I’ve come around to that way of thinking. 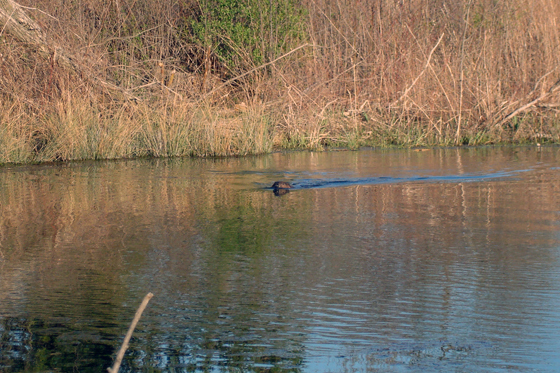 At first I just couldn’t believe that we had a beaver on our property! Have you seen it many times since? I haven’t seen it since. We had a fisher this year, but again it was a one-time sighting. Hmm, I guess it’s a good thing you got the video, then! I’ve heard beavers and such-like come out more at twilight, do you ever walk down to the pond at that time of day? It’s usually after work… not quite twilight, but evening.